From ice-skating locales with only sun-soaked winter skies and far-as-the-eye-can-see mountain views to urban and resort settings surrounded by busy shops and restaurants, Colorado’s outdoor ice rinks bring back-to-basics joy to this classic winter pastime. During the holiday season (November through January-ish), the west side of Colorado Springs’ Acacia Park becomes a hub of activity that revolves around the skating rink. Skate in the Park has themed nights, live music, food vendors (and a Santa or two) through January. Outdoor ice skating in Denver happens in the middle of downtown at Southwest Rink at Skyline Park along 16th Street Mall November to February. Bring your own skates or rent theirs; handy learn-to-skate stabilizers make sure spills are kept to a minimum, and the options for warm post-skate beverages nearby are vast. And if you're trying to squeeze in one more Colorado activity on your way out of town, Denver International Airport has its own rink, which typically runs late November to early January with the nice price of free! Several Colorado State Parks have natural ponds that offer skating amid some of the state’s most scenic vistas, including Yampa River, Golden Gate Canyon, Highline Lake, Jackson Lake, Cherry Creek and Eleven Mile. When you’re done gliding around the pond, you’ll have the parks’ myriad other snow activities to choose from — snowshoeing, cross-county skiing, sledding or tubing, wildlife viewing and more. Check conditions with the individual parks before you head out. Just north of the Swiss-inspired town of Ouray, the Rotary Park rink is surrounded by purple mountains majesty, and locals are known to drop in for impromptu hockey or broomball games. Though the rink features a small warming hut, a soak in the nearby 96- to 108-degree Ouray Hot Springs and Orvis Hot Springs pools will ward off the chill after you’ve spun your final figure eight. The Crested Butte Nordic Center's rink is situated on the edge of this classic southwest-Colorado ski town. With 45 kilometers of groomed cross-country and snowshoe trails, a sledding hill, warming huts and winter photography workshops, the Nordic center provides the whole family with new ways to occupy snowy days. Just west of Denver in Evergreen, 40-acre Evergreen Lake is a skating haven. This frozen destination includes a boardwalk for parents to watch their kids play on the ice, picnic areas and an easy hiking loop. There are also 11 pond hockey rinks. The warming hut has snacks, warm beverages and a cozy fireplace. One of the largest Zamboni-maintained outdoor rinks in North America, Keystone Resort’s Dercum Square Ice Rink frozen alpine lake is kept in tip-top skating condition for day and night skaters — just one of the resort’s Kidtopia activities, which extend to cookie happy hours, a snowfort, disco tubing, fireworks, scavenger hunts and many others. The YMCA of the Rockies just outside of Estes Park offers outdoor ice skating surrounded by Rocky Mountain National Park’s dramatic snow-covered peaks. The YMCA’s inviting fireplaces welcome pink-cheeked skaters to relax with a mug of hot chocolate. For more winter fun, the facility also leads snowshoe hikes through the park. The 9,000-square-foot Black Family Ice Rink in Beaver Creek fits right in with the resort’s reputation for luxury. A Zamboni creates perfect ice conditions every three hours, lounges around the rink’s perimeter let parents supervise their skaters in comfort beneath heat lamps, hot cocoa and posh accommodations are just steps away, and lights around the rink in the evening give it a warm glow. Winter Park Resort's Village Ice Rink offers free lessons, rentals and views of the dramatic peaks of the Continental Divide. The Kendall Mountain Recreation Area is home to a small ski hill, as well as snow- shoeing trails, a sledding hill and ice skating with jagged San Juan Mountain views — a particularly beautiful sight by moonlight. Just south of downtown Lake City, Colorado’s second largest natural lake, Lake San Cristobal, is host to ice skating that typically begins in December, depending on weather. The lake freezes over into crystal-clear ice that is incredibly smooth and ready for your skate’s blades. Eat up the ice as you race your family and enjoy your time amid the jaw-dropping mountain scenery covered in snow. 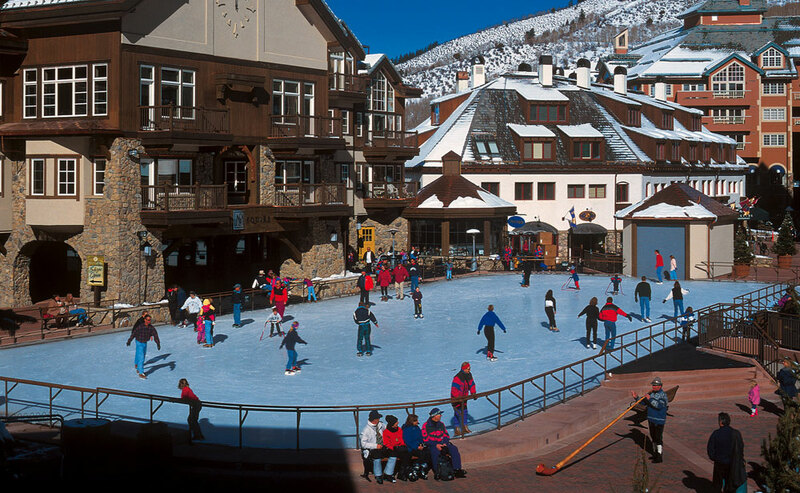 Photo: Black Family Ice Rink in Beaver Creek; photo by Jack Affleck for Beaver Creek Resort.